Charles Darwin University’s Waterfront campus will be buzzing during October Business Month (OBM), hosting a range of events. Home to the university’s College of Business and Law, the Waterfront campus features modern teaching and training facilities that are perfect to support OBM events. 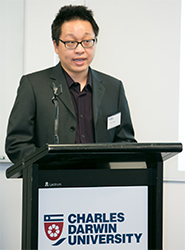 Dean of the College of Business and Law, Professor David Low said the OBM events were a great way to showcase the facility while delivering upskilling and capability enhancing workshops that will benefit local business operators. “We are thrilled to be hosting eight events at the Waterfront because we will be able to give participants an understanding of the great facility we have and the type of knowledge and expertise we have in the College,” Professor Low said. OBM events at the Waterfront campus range from threatened species tourism opportunities to a workshop for not-for-profit board members on their roles and responsibilities. These events are held in collaboration with the private sector such as PaperBark Woman, Acute Guess and CPA Australia as well as the public sector in the form of the Australian Securities and Investments Commission. In addition to these workshops there will be co-presentations with Indigenous men and women already engaged in business. CDU Vocational Education and Training and higher education staff will deliver two workshops. A number of events will focus on Indigenous businesses – from recognising business opportunities to start-up issues, to Board membership, to making business connections – representing a great opportunity for Indigenous people considering starting an enterprise and existing businesses looking at expansion. Professor Low said OBM was a great event and CDU was proud to be involved. “These events are a great opportunity to come and discover how the College of Business and Law can make a difference to business aspirations and horizons,” he said.